Ryley taking a moment to reflect on the beauty of his buck. It’s getting colder and the days are getting shorter. Winter is officially knocking at our door. But that hasn’t stopped us one bit. Two weekends ago Ryley and I set out to accomplish two tasks, go on our first camping trip with his new Boy Scout Troop and get him a deer during our short youth season. The week leading up to our action packed weekend was filled with the unloading of our fishing gear from our previous adventure and the reloading of the suburban for a weekend camping/hunting trip. Luckily for us we wouldn’t be traveling too far to accomplish either. Saturday morning came and we found ourselves in a familiar spot. We were sitting in Ryley’s double tree stand at his Aunt and Uncle’s farm. Smack dab in the middle of a cow pasture hunting the wood edge and hedge rows. It was quite cold and within an hour Ryley was confirming with me just how long we intended to stay out hunting. I gently reminded him that we had a camping trip to go on in a few short hours. All of those questions faded away as we caught the glimpse of four does making their way out into the field. We watched them for a good half an hour as they ambled their way closer to us. As they got close Ryley and I noticed several 4 point bucks about 400 yards off in the distance. As soon as Ryley saw the glint of white that was the small rack he was entranced. But the buck hung back as those first four does got closer and closer to us, finally coming into range about 150 yards out. 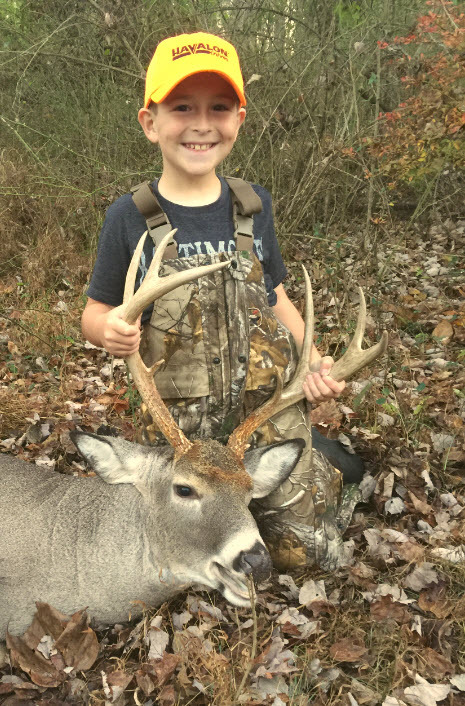 It was decision time and Ryley kept his eyes on the buck and decided he would take a chance that the does would slip into the woods before the buck decided to move. And that is just what they did. Within a few minutes the buck went the other way as well and there we sat. But it wasn’t long before we saw even more does come into the field followed by what looked like a nice mature buck. As we watched those deer I saw movement across from us on the hedge row and one of the 4 point bucks had reemerged with a doe by his side. As we sat and waited for things to play out I saw the 4 point stop dead in his tracks as a chocolate racked 7 point stepped up to his doe and lead her away. The 4 point quickly bounded off defeated. But Ryley had his attention on the larger buck that was still a ways off. When I managed to glass the buck it looked like a nice solid 8 point. Ryley was beside himself. Then, as quickly as it started it was all over. The neighbor had driven her car down her driveway and scared the deer off. Now Ryley was asking me if we could stay just a little bit longer. With promises of coming back on Sunday afternoon we packed up and headed home to get ready for our camping trip. My wife Dawn, joining us for our campfire dinner. By 2:00 pm that day we had arrived at our campsite in the woods and were welcomed by Troop 270. This wasn’t technically our first campout with the Troop as this is the same troop all my boys have belonged to and even before Ryley became a Tiger Scout we were regularly camping with them. The day was filled with activities to keep Ryley engaged in learning new scout skills and getting to know some of the older scouts who he had not already befriended. That evening we had a splendid meal of fried chicken and sides all cooked in cast iron over a roaring fire. The night ended with a flag retirement ceremony and Ryley participating by throwing in the stars on the field of blue. Ryley participating in our flag retirement ceremony. The next morning I was up at 6:00 am packing my tent furiously so that we could leave at whatever time Ryley wanted. About an hour later Ryley woke up and decided that instead of hunting the afternoon he wanted to pack up as quickly as he could and head over to the farm that very morning. We said our goodbyes and headed back to the farm. The boy had buck fever, bad! By the time we go to the farm it was already 8:00 and although we saw a few does running through the cow pasture we didn’t see much signs of life other than the cows. We walked the back hay fields and managed to jump up two does on our way back to the truck. But they ran off before either of us could react. We headed home for some lunch with the intent of coming right back to the farm. With our stomachs full we again decided to check the back hay fields. To our dismay on the way back we saw a heard of does up by our Suburban as they ambled towards the farm house. By this point Ryley was becoming discouraged thinking he had missed his real good chance at a deer the previous morning. I told him not to worry, we still had a few good hours of hunting light left. I suggested we end our day in the same tree stand we started in the previous morning. Begrudgingly Ryley made his way to the stand and up we went. Within a half an hour of getting in the stand I saw movement directly across the field from us, near where we saw the 7 pointer the previous day. At first I just saw a couple of does but then quickly realized that the big 8 pointer from the previous day was about 400 yards from us. We sat there for a while trying to will the deer to come out into the field a little closer to us. They just wouldn’t budge. So I asked Ryley if he was willing to take a chance and go after that big buck from the ground. He didn’t even hesitate. We silently crept down the ladder and into the open field. We were lucky in that the ground was sloped so that the deer couldn’t initially see us as we approached out in the middle of the open field. We slowly made our way a hundred yards and stopped. Through my Vortex binoculars I verified the does were still there but I had lost sight of the buck. Ryley said he would be happy with just shooting a doe so we crept a little bit closer, this time hunkering down in the field as we watched the deer in the distance. Then just as we were talking about which doe he wanted to shoot I saw him again, running around the wood line chasing a doe. The buck was still there! But as quickly as he had emerged he was gone again, slipping into the woods. At this point my heart was racing and I know Ryley’s was too. We exchanged looks for a brief minute and silently decided that we would wait the buck out. We half crawled our way to within 150 yards of the does and slowly stood up. Why hadn’t they seen us by now? It didn’t matter. We were on our feet for only a minute or two, though time seemed to have slowed down at this point, when a doe came running out of the woods. I told Ryley to get ready because the buck would be following her. And out he did come, trotting after her. I honestly don’t remember the next set of events too clearly. Tunnel vision set in and the only thing I was concentrating on was the buck. I don’t think the deer even stopped. BANG. I saw the buck lurch as if it were hit a little far back and then watched him regain his legs and run off into the woods. My heart sank. But then I looked up and the does were just standing there. I asked Ryley if he wanted to shoot a doe, he nodded and she crumpled within 50 yards, from what I would later find out to be a shot to the top of the heart. She had run right to the opening of where the buck had disappeared. We quickly check on her and she was already dead so we looked for some sign of blood on the ground. We walked all the way down the fence line to where I thought the buck was when he was shot. No blood. Not even a speck. Ryley was already commenting that he thought he missed the buck. I wasn't so sure about that so we kept searching for any sign of blood, even the smallest of specks. As we made our way back to where the doe had fallen I looked up and there on the side of a small sapling was a streak of red. Not just a splatter but a large swatch of blood. Over the fence we went in search of the buck. I usually like to give them time to die but the sun was setting and light would be gone within an hour. Ryley and I tracked the buck through briers and sticker bushes, into bedding areas all the while twisting and turning as we went. We had to stop a few times and backtrack to pick up a drop of blood here or a smear on a leaf there. The glint off the antler's told us where the buck had fallen. I was beginning to think we might have lost him and was about to tell Ryley we might have to head back when I saw a glint of white in the fading light. There he was about 50 yards off to the side of us crumpled up in a heap. I pointed the buck out to Ryley and he was speechless. We quickly went over to the deer to make sure he was dead and that’s when Ryley did it. He reached down to stroke the hair on the deer, as if to say "thank you for giving himself up to me". We said a small prayer thanking God for blessing us this day. I snapped a few pictures and then we proceeded to tag the deer and drag him out, only I had forgotten my knife back at the tree stand. On the hoof this deer was well over 200lbs and after much huffing and puffing I had managed to get the buck into the field just as the last rays of light were shining. I quickly staged the buck and doe together and snapped a few more pictures of Ryley before the cavalry arrived in the form of his Uncle Milt with his four-wheeler and wagon. A quick shot of Ryley and his deer before I had to drag him out. Ryley with his 8 pt buck.